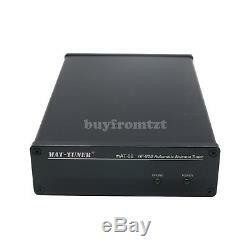 MAT-30 HF-SSB Automatic Antenna Tuner 120W Auto Tuner Automatic Ham Radio for Yaesu. 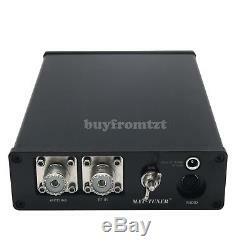 Transceiver that supports an FC-30, FC-40 or FC-50. Tuner;a partial list of compatible units includes:FT-100, FT-857, FT-897, FT-450D, FT-891. The interface cable is included. The operating is the same as the method of the. Tuner, which is simple and convenient. The mAT-30 can work within the range of 3MHz to 54MHz. The mAT-30 connects to the radio via its CAT/LINEAR jack to control the tuning cycle;the transceivers Tune button controls the tuner. The CAT/LINEAR jack also powers the tuner, so it requires no external power supply. The mAT-30 is specially engineered to integrate with your. Tuning is performed when the TUNE button is pushed. On the front of the transceiver and held for one second. The mAT-30 provides automatic antenna tuning across the entire. HF spectrum plus 6 meters, at power levels up to 120 watts. The mAT-30 connects to the. On the back of the radio. 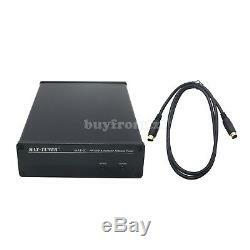 The CAT interface allows an external device such as a PC or the mAT-30 to control the FT-100/857/897/450D/891 by sending it serial commands. The mAT-30 takes advantage of this interface to simplify the tuning process --one button push is all that is needed in order to switch the radio to FM mode, reduce output power, transmit a carrier, measure the transmit frequency, and then restore the radio to its previous mode and power level! You can also start a tuning cycle manually whenever necessary. The mAT-30 has16,000 frequency memories. When tuning on or near a previously tuned frequency, the mAT-30 uses "Memory Tune" to recall the previous tuning parameters in a fraction of a second. If no memorized settings are available, the tuner runs a full tuning cycle, storing the parameters for memory recall on subsequent tuning cycles on that frequency. In this manner, the mAT-30 "learns" as it is the bands and frequencies as it goes. 0.1 to 120watts SSB and CW peak power, 30 watts on PSK and digital modes, and 100 watts on 6 meters. 16,000 memories for instantaneous frequency and band changing. Radios that are FC-30, FC-40 or FC-50 compatible. Partial radio list: FT-100, FT-857, FT-897, FT-450D, FT-891. Tuning time:0.1 to 5 seconds full tune, 0.1 seconds memory tune. 1.8 to 54.0 MHz coverage. Tunes 5 to 1500 ohm loads. For dipoles, verticals, Vees, beams, long wire or any coax-fed antenna. AN IMPORTANT WORD ABOUT POWER LEVELS. The mAT-30 is rated at 125 watts maximum power input at most. 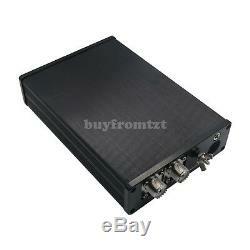 Many ham transmitters and transceivers, and virtually all amplifiers, output well over 125 watts. Significantly exceed specifications will definitely damage or destroy your mAT-30. If your tuner fails during overload, it could also damage your transmitter or transceiver. Be sure to observe the specified power limitations. 1 x mAT-30 HF-SSB Automatic Antenna Tuner. Usually it cost about 35USD-50USD. If you receive defective item, please kindly notify us within 14 days. The item "120W mAT-30 HF-SSB Automatic Antenna Tuner Auto Tuner Automatic Ham Radio" is in sale since Friday, August 17, 2018. 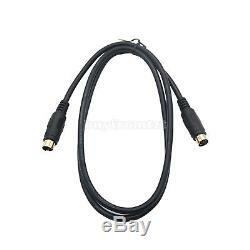 This item is in the category "Electronics\Radio Communication\Parts & Accessories\Tuners". The seller is "buyfromtzt" and is located in Shenzhen. This item can be shipped worldwide.